Saturday December 11th 1909 It was a wintry day with sleet and snow. Will did not care to go to town and I did not dare venture out put in the time with the house work and my tatting. Sunday December 12th 1909 It was twelve years ago today we put Edith away in the vault. It was snowing most of today. They wanted me to come down home but I did not dare go out. I read some. Otto Jellison was down home from Des Moines to spend the day. Monday December 13th 1909 It was a cold wintry day. Will went down to have some work done at the dentists I worked on my tatting all my spare time Tuesday December 14th 1909 It was much milder. After will did his chores he helped me and we put out a big washing by one oclock I even wiped up the floors to both kitchens. I got our dinner over and the clothes were [air condition?] 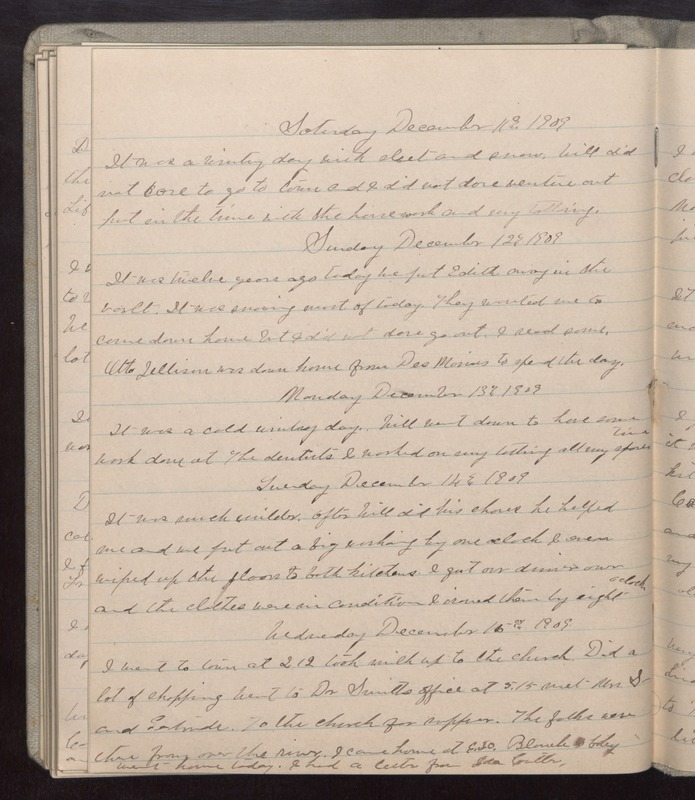 I ironed them by eight oclock Wednesday December 15th 1909 I went to town at 2.12 took milk to up the church. Did a lot of shopping went to Dr Smiths office at 5.15 met Mrs S and Gertrude. To the church for supper. The folks were there from over the river. I came home at 6.30. Blanche [baby?] went home today. I had a letter from Ida Cutter.